Given CIRM’s huge presence in the field, a review of the research projects that CIRM chooses to fund should offer important insights into which avenues of research this “largest provider of stem cell research funding in the world” sees as most promising to pursue in realizing the predicted potential of stem cells to cure a whole host of diseases and conditions. CIRM was established as a result of passage of Proposition 71 in November, 2004. That referendum called for $3 billion in state funding (via bond issues), spread over 10 years, for stem cell research (with interest, the eventual cost to California taxpayers will be $6 billion). CIRM was established to oversee distribution of the funds. While all stem cell research would be eligible for funding, CIRM’s mission was to give priority to human embryonic stem cell research (hESCR) and other areas that received only limited or no federal funding, such as human Somatic Cell Nuclear Transfer (SCNT), or human cloning for research. The reason hESCR was singled out for funding priority can be found in the heated political/ethical public policy debates over funding for human embryonic stem cell research that began in the late 90’s and continue to this day. In a televised address on August 9, 2001 President Bush announced that his administration would provide federal funds for hESCR (thus becoming the first to do so). However, only research using embryonic stem cell lines that had already been developed as of that date would be eligible for the funding. This compromise was aimed at accomplishing two things: allowing the research to move forward to see if it could indeed provide substantial therapeutic benefits for a whole host of diseases and conditions (as its supporters claimed), while at the same time discouraging the future destruction of embryos, as research using stems cell derived after 8/9/01 would not be eligible for funding. Proposition 71 can best be seen as California’s response to the limits the Bush administration placed on hESCR and its opposition to cloning human beings for research. One of the prime movers behind Prop. 71, Hollywood director Jerry Zucker, produced a television ad ridiculing the president’s stem cell policy. The Los Angeles Times characterized Prop. 71 as a “rude and deserved raspberry… intended to both insult and subvert President Bush’s decision” limiting federal funding for hESCR. In short, if the administration would not adequately fund such research, then California would. The referendum passed handily in November, 2004 with 59% of the vote. Before it handed out its first research grants, in 2006 CIRM adopted a 10-year strategic plan that was starkly at odds with the hype and wild promises of cures that proponents of Prop. 71 had used to sell the referendum to voters in the run-up to the 2004 election. Those highly exaggerated promises not only encompassed claims about a wide variety of prospective medical breakthroughs, but claims of windfall economic benefits to California and its citizens as a result of those breakthroughs. A widely circulated analysis commissioned by the pro-Prop. 71 Californians for Stem Cell Research and Cures predicted “a 120% to 236% return on the investment made in the research” and “state royalty revenues of from $537 million to $1.1 billion” from the foreseen medical breakthroughs, among many other economic benefits for the state. But the goals set out in the 10-year plan were quite different. Laying out its “commitment goals” – i.e., goals for which CIRM would be held accountable – the report baldly stated “it is unlikely that CIRM will be able to fully develop stem cell therapy for routine clinical use during the ten years of the plan.” Instead, the strategic plan now called only for “clinical proof-of-principle that transplanted cells derived from [human embryonic] pluripotent cells can be used to restore function for at least one disease” and “therapies based on stem cell research in Phase I or Phase II clinical trials for 2-4 additional diseases,” among other goals. The first set of research grants issued in pursuit of CIRM’s now heavily scaled-back goals came in February, 2007. Dubbed “SEED” — “Scientific Excellence through Exploration and Development” – these initial grants numbered 72, were for two years and totaled $45 million. 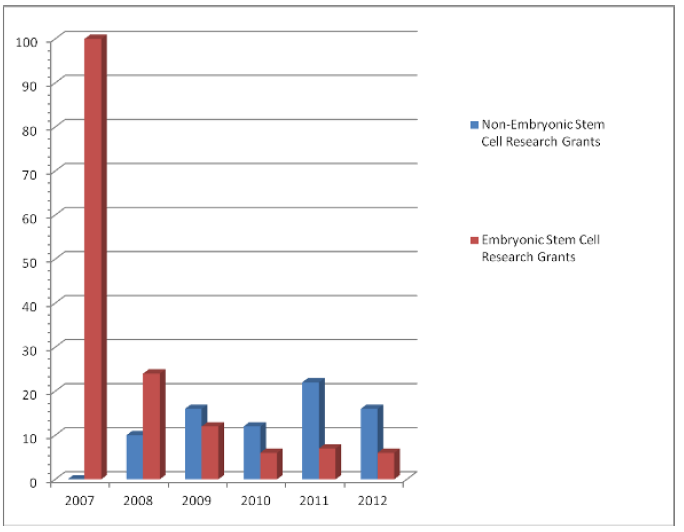 The stated intention of the SEED Grant Program was “to bring new ideas and new investigators into the field of human embryonic stem cell (hESC) research…” True to its purpose, all of the SEED grants issued were research projects working with hESCs; one research projected was for SCNT, or human cloning for research purposes. One month later, CIRM followed up by issuing 29 four-year grants under the Comprehensive Research Grants Program, totaling $75.7.million. This grant program was designed “to support mature, ongoing studies on hESCs by scientists with a record of accomplishment in this field.” Again, as with the SEED grants, all of these grants were for hESCR; of these, two also included SCNT research (here and here). Thus, by the end of 2007, CIRM had funded just over 100 discrete research projects, all involving hESCs and/or SCNT for a total of $121 million. 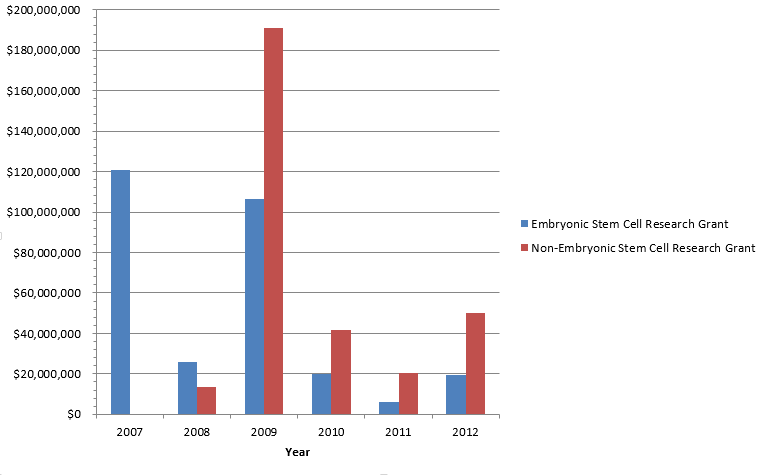 Adult and other non-embryonic avenues of stem cell research received virtually no funding. In 2008, CIRM announced a new grant category, the “New Cell Lines Awards,” to “support the derivation and propagation of new lines of pluripotent human stem cells.” Sixteen grants were awarded for a total of $23 million. Eight of the research projects involved hESCs, with five of those also including “induced pluripotent stem cells,” (iPSCs) and totaled just over $11 million. The other eight funded projects were for iPSC research alone and these totaled $11.7 million. This was the single largest amount of money CIRM had awarded to research projects that did not in some way involve hESCs. However, the single largest block of grants awarded in 2008, at $271 million, was not directly for stem cell research as such, but went instead to develop infrastructure under CIRM’s “Major Facilities”grant program. In other words, the 2009/2010 Strategic Plan Update called for increased emphasis on those projects that had the best chance of leading to clinical trials and therapies in the shortest period feasible. The grants numbered 15 for a total of just under $68 million. This round of grants showed a marked move to increase funding for adult stem cell and iPSC research. Of the 15 grants awarded, nine were for hESCR, and of those nine, three also included research utilizing iPSCs. These grants totaled approximately $35 million. Fully six of the grants were for research projects that used adult stem cells and/or iPSCs and did not use hESCs or SCNT at all. These grants totaled approximately $33 million. The grants went to 14 research team projects, and the funding represented an international collaboration: more than $250 million total, with Britain’s Medical Research Council contributing $8 million and Canada’s Cancer Stem Cell Consortium contributing $35 million. This was the largest block of grants for research projects that CIRM had yet issued. Out of those 14 grants – specifically awarded with the intention that they had the best chance of resulting in clinical trials – only four went to hESCR and amounted to $71.5 million. The remaining 10 grants all went to projects involving adult stem cells, iPSCs or other non-embryonic avenues of research and totaled $158,222,284. “In something of an irony, little of it is going to the reason the institute exists – to work with human embryonic stem cells,” the Knight Science Journalism Tracker commented. The single largest distribution CIRM made in 2010 was on October 21 for a second round of grants under the “Early Translational” awards program. The grants went to 19 recipients for a total of $67 million. A comparison of the breakdown of this second round of Early Translational grants with the first such issued in April, 2009, is instructive. As previously noted, six of the 19 grants awarded under the first round of the Early Translational awards were for work using non-embryonic adult and/or induced pluripotent stem cells. In 2010’s Early Translational II round of grants, that number doubled: 12 of the 19 grants distributed were for work utilizing adult stem cells or iPSCs alone. These grants totaled just under $42 million. Only five grants, totaling $18 million, were for research utilizing hESCs. No grants were given for SCNT. The second round of “Tools and Technologies” grants awarded in January 2011 was even more indicative of a trend toward increased funding of non-embryonic stem cell projects and a decrease in funding for hESCR. As noted above, of the 23 grants issued under Tools and Technologies I in 2008, sixteen went to projects involving hESCs (four of these also included work with adult/iPSCs). Only two went to projects using only adult stem cells. In marked contrast, of 19 grants awarded, only three grants were given to projects primarily using hESCs in 2011 for a total of $5.5 million. Ten were given to projects using adult stem cells and pluripotent stem cells for a total of $17 million – over three tmes the amount awared to hESCR under this category. Six were awarded to “neutral” projects for such things as improving ways to deliver and track stem cells, improved imaging, etc. Even more dramatic confirmation of CIRM’s increasing embrace of adult stem cell and other avenues of non-embryonic stem cell research came in a round of grants distributed in August, 2011. The amounts distributed in August under the “Disease Team Therapy Development Awards” were modest in cost – $1.8 million – but dramatic in substance. So which projects did CIRM choose as showing “the most promising approaches” of leading to clinical trials? Sixteen of the 19 grants awarded addressed the potential therapeutic uses of stem cells. Of those, 12 were non-embryonic and totaled $1.1 million (11 using adult stem cells and one using iPSCs). Only four involved hESCs and totaled $412,000 – less than half the amount given to the non-embryonic stem cell projects in this category. Once again, in handing out grants based on their potential to prove therapeutically beneficial, CIRM showed a clear preference in favor of adult and other areas of non-embryonic stem cell research. One noticeable exception to this trend occurred in 2011, when CIRM approved a $25 million loan to Geron for its early clinical trial using hESCs to treat spinal cord injury (SCI). Geron and its representatives had been promoting this clinical trial as imminent at least since 2002, but the FDA did not give approval for it until January 2009. Although the FDA approval was met with much fanfare, Geron called off the trial, citing financial difficulties, just over a year after the first patient was treated. So the only clinical trial using hESCs that CIRM had the opportunity to help finance has turned out to be a dead end. On May 24, 2012, CIRM issued its third round of Early Translational grants; unsurprisingly perhaps at this point, they heavily favored non-embryonic avenues of stem cell research. Twenty-one grants were issued. Only six of those went for work with hESCs (and one of those also included work with iPSCs) for a total of $19 million. The remaining 15 grants all went to non-embryonic stem cell avenues of research, including iPSCs, adult stem cells and the direct reprogramming of adult cells. They totaled just under $50 million – significantly more than double the amount given to hESCR under this category. The trajectory of CIRM’s grant-making since 2007 – halfway into its 10-year life —certainly argues that such alternatives to hESCR do indeed exist. CIRM’s “natural evolution” to placing increasing emphasis on clinical trials has led it to provide more and more resources to adult and other non-embryonic avenues of stem cell research, and fewer and fewer to hESCR. Adult stem cells may be “less glamorous” in some esoteric sense than their embryonic counterparts, but in terms of arriving at real therapeutic benefits for patients, they are the warhorses getting the job done. As CIRM’s grants show, the “alternative” has now become the preferred option. CIRM has created various categories over the years for awarding grants. Some of these categories encompass infrastructure and training and it is often difficult to clearly categorize grants awarded under these categories as “embryonic/non-embryonic” stem cell research. New lab space that is created as a result of a grant, for example, can be used to conduct either type of research. Attention in this article will be mainly focused on discrete research projects where the intent of the researcher is to investigate hESCs, adult stem cells, iPSCs, SCNT or a combination thereof. In 2006, sixteen California institutions received $12.1 million from CIRM to train 169 new stem cell researchers; the February2007 grants were the first for specific research projects. In addition to these Comprehensive grants, CIRM also announced an additional 2 SEED grants, both for hESCR and totaling $1.1 million. That same day CIRM also announced a new grant category of “Disease Team Planning” and provided a modest $1.1 million in grants. Induced Pluripotent Stem Cells (iPSCs) are stem cells that have been derived from an ordinary somatic cell (such as a skin cell) that has been reprogrammed to a fully pluripotent, embryonic-like state. The process does not involve SCNT. A relatively recent development at the time the New Cell Grants were awarded, researchers first produced iPSCs from mice cells in 2006 and from human cells in November, 2007). CIRM also handed out $59 million in a second round of “New Faculty” grants to support personnel who are “at critical early stages of establishing careers in stem cell research.” The first “New Faculty” grants were awarded in December, 2007. Trounson formally took up his position as CIRM president in January, 2008. One category was the “Basic Biology Awards.” These awards were on a far more modest scale, going to 28 projects over the course of 2009-2010, for a total of $38.7 million. The awards funded a mix of studies involving hESCR, adult stem cells, and iPSCs. One Early Translational Grant project can be found listed as both Embryonic and Adult using CIRM’s grant search engine; however, the abstract provided makes no mention of hESCs as part of this project, referring instead to adult stem cells and iPSCs. Two of the grants fell into a separate category to study cancer stem cells. In November, 2010, CIRM awarded $1.1 million under Early Translational to another project using hESCs, bringing the number of such grants up to six and the total amount for hESC research in this category to $20 million. In January, 2011, CIRM awarded $2.3 million under Early Translational for a project using iPSCs, bringing the number of non-embryonic research projects under this category up to 13, more than twice the number of hESCR projects. Five grants went to research project on technical issues, such as developing better tools and methods for imaging and tracking stem cells. The remaining awards addressed other areas, such as drug testing and cancer cells. Geron has paid back the $6.4 million it actually received from CIRM in full, with interest.